Husband made dinner and it tasted amazing! I don’t normally post about food because, though I like to eat, it’s not a passion of mine. I leave that to the experts and amateur experts. I am not a fan of meatloaf but this was worth every bite. That’s chop meat spread out with cheese slices topped with sautéed onions and peppers on one pan. Bacon slices laid out end to end on another pan. Then roll the meat concoction on top of the bacon. Then bake in the oven wrapped in foil for a half hour and uncover for another half hour, or until the meat is the desired temperature. (Or something similar!) The end result is this wonderful, bacon tasting meatloaf. It didn’t taste like a meatloaf. He substituted provolone cheese for cheddar cheese because he isn’t a fan of the provolone, but next time he said he would do it half and half. So this weeks grateful moment: after working just over 9 hours, I came home to dinner almost ready. It just needed a little extra time – just enough for me to change into comfy clothes. Just a little something for the family when they woke up Thanksgiving morning. I don’t usually make breakfast for the gang, as they are all out the door at different times. But on holidays, I try to do something special. 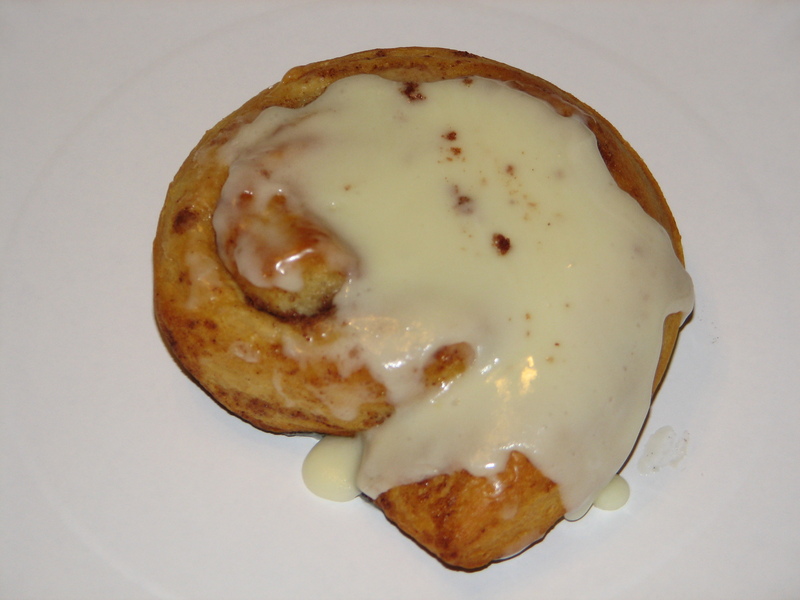 Not that cinnamon rolls are special, but the look on the kids faces when they stagger into the kitchen is priceless. They aren’t required to do anything other than grab a dish, sit at the table, and enjoy. Easy, peasy. Having lived along the Atlantic Ocean for 15 years with yearly visits, I was going to thumb through my pictures for this challenge. But then I decided to take a different route. I had purchased strawberries from a school fundraiser which arrived Monday night. As I was looking at the flat of strawberries, toppling over the edges of the box as I brought them into the kitchen, the words “photo-op” were screaming in my ears. Well, not literally, of course. But as my camera is never further than an arm’s length away, I had absolutely no choice. The camera was taunting me. I took out my camera and started taking pictures from all angles, using different settings for light, color, perspective. With the dinning room light on, with it off, flash, no flash. You get the point. Strawberries are part of nature’s way of welcoming the warm weather after months of dreary, cold winter. The bright red representing the stop light signalling the end of snow. Yeah, nature gets mixed up now and then, mixing in those beautiful warm days in the midst of cold, rainy days. Which is okay when you consider strawberries are a little confused, too. Strawberries are not berries, they are fruit that is part of the rose family. So you see, strawberries and spring go together perfectly. How did I get to strawberries from ocean? 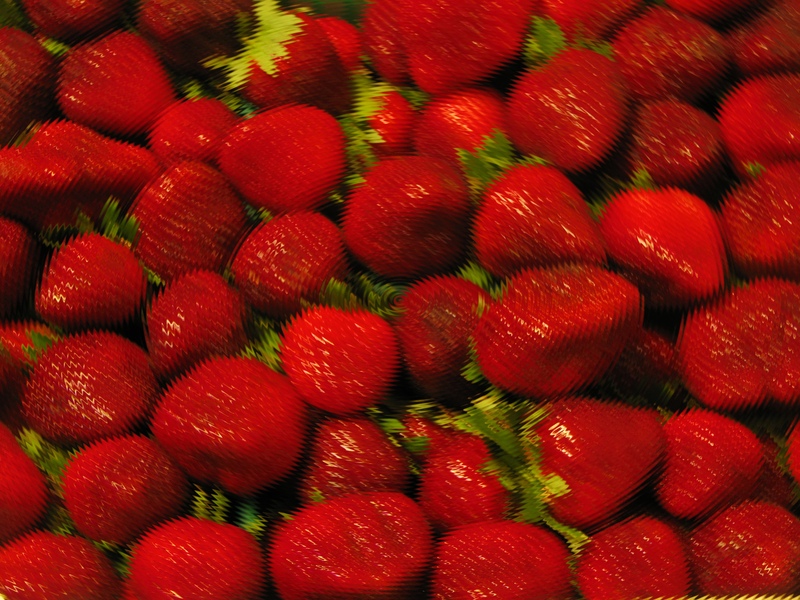 Easily enough…there is an ocean of strawberries over taking my refrigerator crisper drawer. The quantity is overwhelming. When first walking into the house there is a faint smell of strawberries. The scent becomes more noticeable the closer you move to the refrigerator. Open the door and the delicious scent of fresh strawberries assaults the nose, kicking taste buds into high gear, anticipating the taste of a plump strawberry. Having said that, I decided I can’t remember what I did this past week. I can recall moments here and there, but I am unable to swear on any information without first consulting my journal. Yet even that is a bit spotty, I might have been cohesive enough to write, but there are only 2 days noted and all real memories have been deleted from my brain. I remember on Monday and Tuesday I read lots of blogs and posts and tweets, which of course brought me to more blogs and posts and tweets. But don’t ask specifics, as I said before, all traces of them are gone. Last night, though, I know what I did. My husband and the 13 yo took a trip to Chicago. With them being 6 hours from home and the princess at work, that left me home to fix dinner for Sean and I. Easy enough, right? But umm…Sean is a whopping 40 lbs wet. He does not eat much, which made me consider the question: “what could I make for a person and a half?” After rummaging through the kitchen counters, I realized there were no ideas coming forth. I told the midget to get his shoes on so we could go out to eat. I mean, heck, how often does dinner consist of just two people in this household? The drive to the restaurant was amusement in itself. As we drove past Taco Bell and Burger King, he did not say much. Then we passed Long John Silver’s and he looked up at me in the rear view mirror, as if asking me with his eyes where we were going. But then we passed McDonald’s–and as he realized we were not slowing down for the turn, he let out a gasp. He thought we were going to eat burgers and fries. Silly kid. As I turned into the driveway of Applebee’s, his face lite up. Sean could not believe we were at a “real” restaurant for dinner. So much so he even asked if I made the wrong turn…the little bugger! We get seated and Sean decides he wants to sit next to me instead of across the table. The kid did have a point. I mean the table was huge! It made Sean look as if he were a toddler. After switching next to him, we ordered our food and did what other normal people do at a restaurant. That is, we observed people, watched a little sound-less television, and talked about our day while Sean was coloring and doodling on the children’s menu. I counted it a blessing as I sat there watching him draw and write a mini-story without having to divide my attention among the other members of my family. The entire time Sean was drawing and writing his mini-story, he was explaining to me what each item was and it’s purpose within the body of his story. Some were simple space weapons to protect them from aliens while others were robotic cows so the kids would have chocolate milk. This went on for the entire course of the meal. When we found our dishes empty, Sean declared it was dessert time. We put our heads together as we studied the dessert menu. By the time the waitress came to our table, Sean knew exactly what he wanted. Would you believe this small framed, tiny kid ordered one of the biggest items on the menu? He ordered what they call the “double chocolate melt”. 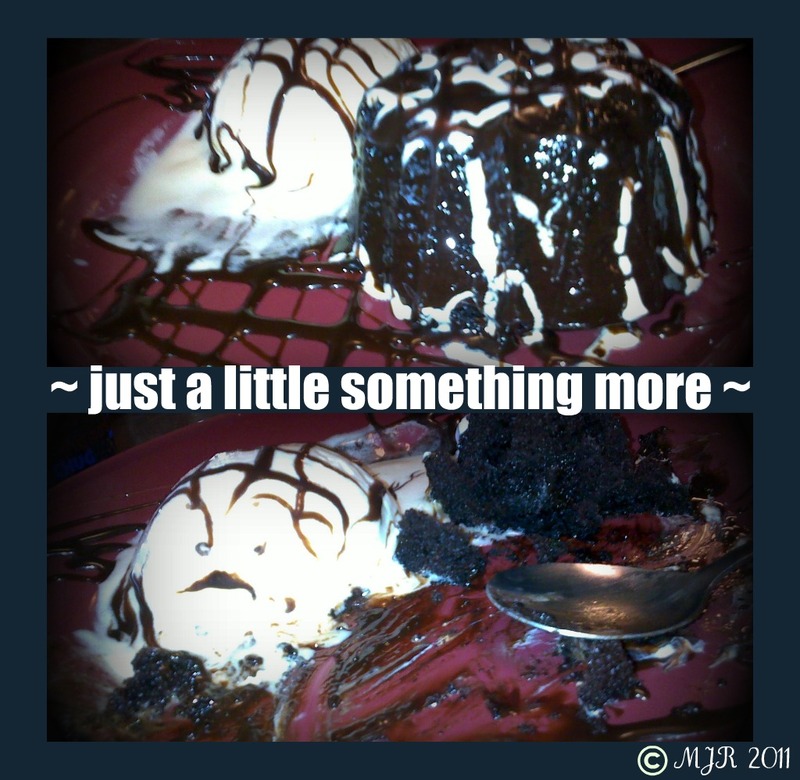 This consisted of a scoop of vanilla ice cream and an equally sized chocolate cake, with fudge in the center. He doesn’t eat a scoop of ice cream at home, so how was he going to finish this dessert? I needed to be certain this was what he wanted; after all, the dessert was more than what he usually ate at home. I asked him if he was positive because of the size of it. He smiled up at me and said “Don’t worry, Mom, it’s just a little something more.” As stunned as I may or may not have been, I allowed him to order it, even though I knew he wouldn’t finish it. When the dessert arrived, his eyes grew wide. I don’t think he realized just how huge it really was, but the joy on his face was worth every cent I paid. It took him almost forty-five minutes to eat as much as he did. When he finished, though, he did not want to bring it home. As we were walking to the car, Sean squeezed my hand and told me he was the luckiest kid in the world because I allowed him to get a dessert I knew he wasn’t going to finish. Talk about a heart squeezing moment. 🙂 Sometimes, you just wish they could stay young just a little bit more.